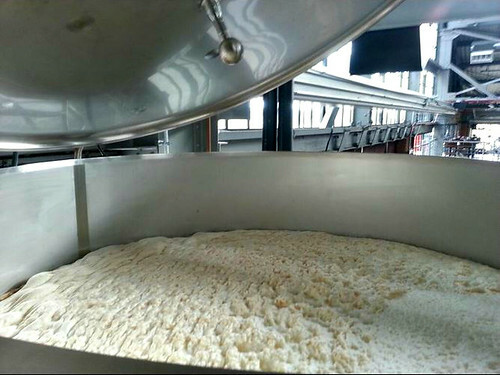 A brewer's-eye view of beer, in an open fermenter, at high kräusen: that is, yeast in fine fettle! Top fermentation, generally associated with ales, is a mode of fermentation in which the flocculating yeast rises to the surface of the fermenting wort, rendering it possible to 'skim' the crop of yeast from the top of the vessel, ready for transfer to the next batch of wort. 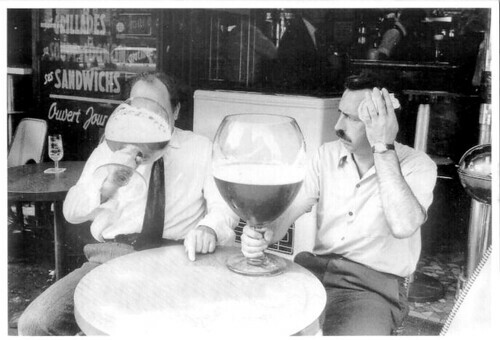 <...> High kräusen is a German term, also widely used in English, which refers to the large, billowing, unkempt head of foam that forms on the surface of beer at the peak of fermentation. <...> In a traditional fermentation cellar, beer ferments in open vessels that allow the brewer to visually control different stages of fermentation. This is a fermentation panorama that most American 'craft' brewers don't often see, because most do not ferment their beers in open fermenters. Nor do they experience the full redolence of yeasty aromas which waft from open fermenters. But the brewers at Bluejacket —a brewery and restaurant, newly opened in Washington, D.C.— do. The photo is courtesy of Bobby Bump, lead brewer at Bluejacket, who posted it to Twitter, 23 November 2013. The beer will become a Belgian-style blond ale, yet unnamed. There is no disputing taste. Is what you taste, what I taste? Does the blue of the sky you see match the azure I note? A deductive discussion for scientists and philosophers, perhaps. But as to gustatory preferences, I stipulate that one can rely on informed, experiential, and enthusiastic suggestions from those whose choices have jibed with your likes and dislikes in the past. Cogent expression counts too. I wrote the following beer-with-turkey exhortation in 2003. Redacted slightly, it remains valid (for me) today, less for specific beer choices (doomed to be démodé) than the reasons for them. As to cogency, I leave that up to the reader. For Thanksgiving this year ... try beer! Turkey can be such a bland dish. Yes, the bird can be served smoked or deep-fried, but even now, as a vegetarian of a couple decades, I remember that the Thanksgiving turkey often needed a 'leg-up'. For that support, I suggest ... beer! When barley is malted and mashed, and when wort is boiled, browning reactions occur between proteins and sugars, just as they do when food is cooked. That creates —as brewer/writer Garrett Oliver has termed it— a flavor hook: "the element of the beer's flavor that mirrors a similar flavor in the food." The toasted, biscuity, caramelly, roasted, and browned flavors inherent to many cooked foods are also inherent to beer. That 'other' beverage choice - wine - fails in bringing those elements to the table. For this reason (and others), beer is a more forgiving (or enlivening beverage) with food than is wine. Indeed, there are few poor beer-with-food choices; rather, there are pairings that are tastier than others. Beer is a vegetarian beverage; it seems natural that vegetables and grains would have an affinity for it. Back to turkey and beer. At the Thanksgiving table, some gourmands have suggested an Abbey-style ale, or a hop-happy IPA, or a German-style weizen as the beer of choice. Although these are fine beverages, I recommend a Saison —Belgian farmhouse-style ale— as the sine qua non. 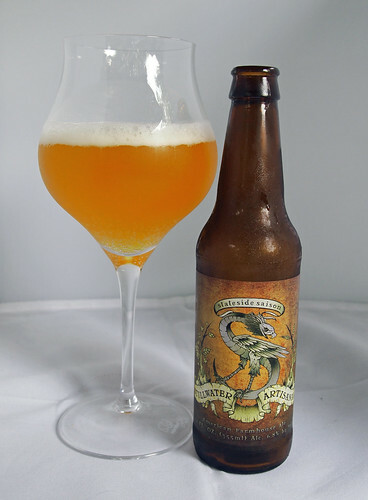 The beer's 'ur-wheatiness,' gentle fermentation character, hints of citrus fruits, and subtle yeast-derived spicing bring interest to the bird without stealing from the meal. To the traditional side dishes of cranberry sauce, sweet potatoes, and, in my household, kugelis (Lithuanian potato casserole), Saisons proffer textural contrast. A classic choice would be Saison Dupont. Or, as an alternative, try Flemish Red Ale. This beer's acidity enlivens the bird -so to speak- while its cherry-like fruitiness mates well with the Thanksgiving meal's sweet accouterments. A few classics: Rodenbach, Duchesse de Bourgogne, or even Liefman's Goudenband (although this would be more accurately described as a Belgian Sour Brown). A pale bock could be another delightful pairing. The sweet malt of this German-style strong lager complements the turkey meat. If I were forced to slum it (okay, only kidding), and drink wine with the feast, I'd open a sparkling wine, or a good Gruner Veltliner. This Austrian white wine marries slightly pungent aromatics, hints of tropical fruit, peppery minerality, and quenching acidity. For a red wine, the wine world's answer to a Belgian red ale would be a Beaujolais. This Gamay grape French red combines sweet cherry fruit with high acidity: appropriate for a bland turkey. 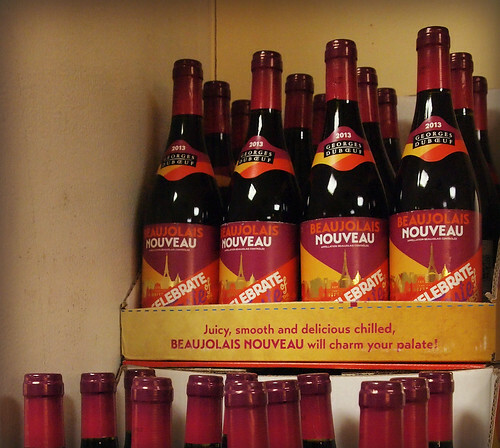 Avoid the relatively insipid, gimmicky, Beaujolais Nouveau. Go with a cru Beaujolais instead. Look for a Moulin à Vent, Morgon, or Brouilly, for example. A more expensive choice, but a more elegant one, would be Beaujolais' northern cousin, red Burgundy, produced from Pinot Noir grapes. Or a Pinot Noir from Oregon, California, or Austria. 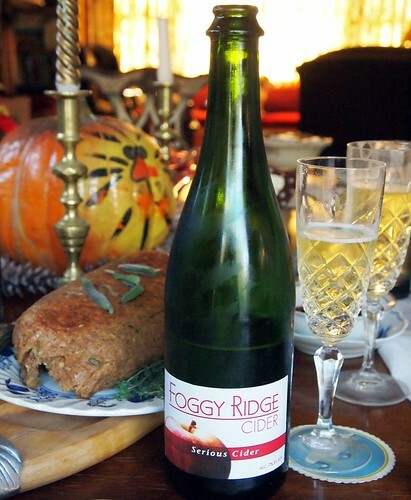 There is another wine, one fermented from apples, that would also go well at the Thanksgiving table. An on-going renaissance of artisinal cider in the U.S. has made finding good cider easier than it had been. Pick one! Baltimore Sun columnist Rob Kasper once proclaimed: "Relatives may look askance at me, fellow diners may tisk their disapproval, but I am going to do it. 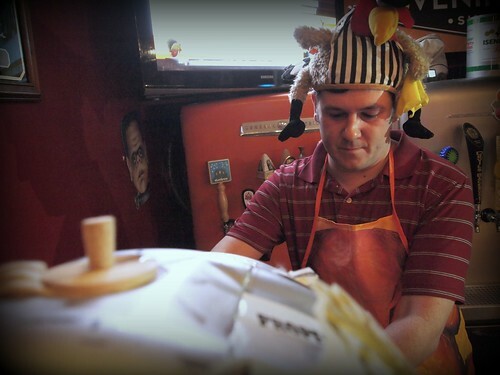 This Thanksgiving, I am going to drink beer with the bird." I myself have resolutely followed this advice for many of my Thanksgiving dinners. Not all my fellow diners have agreed with me. 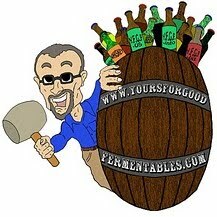 The beer prophet may preach alone, but he is never thirsty! 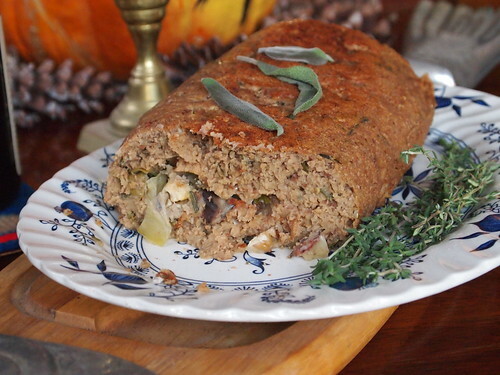 VeggieDag Thursday: Recipes for a vegetarian Thanksgiving. A Tuesday-before-Thanksgiving edition of VeggieDag Thursday. Chipotle Mac & Un-Cheese with Roasted Brussels Sprouts. Via Isa Chandra Moskowitz of the Post Punk Kitchen. Quinoa and Kale Cakes. Via Vegetarian Friend. 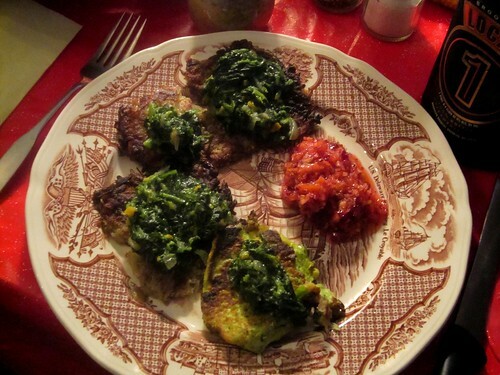 Parsnip/Potato Latkes topped with vegan 'Creamy' Spinach. Via YFGF. 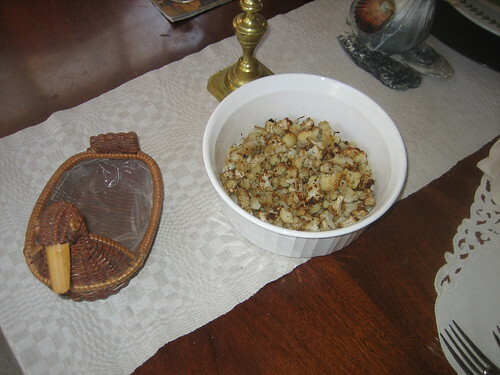 Apple-Herb Stuffing. Via Smitten Kitchen. Make your own cranberry sauce. Language alert: Thug Kitchen is not shy. Vegetables take center stage for a vegetarian Thanksgiving. Via Joe Yonan, Food Editor for Washington Post. Also from Post Punk Kitchen: a cornucopia of Thanksgiving vegan recipes. This is a great resource. The holiday tradition at the Evening Star continues! We'll be pouring from a wooden cask of Heavy Seas Loose Cannon IPA, which has been additionally spiked with soft maple wood chips and Northern Brewer hops. For a beautiful comparison, we will also pour regular Loose Cannon on draft, and some deliciously fresh kegs of Heavy Seas Winter Storm Imperial ESB! The firkin taps at 6pm. Live music from the Joe Chiocca Band starts at 8pm. Come celebrate and give thanks a little early with Evening Star! Seven years ago, on Thanksgiving Eve 2007, a cask of Loose Cannon would be the first cask-conditioned beer ever served at the Evening Star, a cozy pub and restaurant in the quaint Del Ray neighborhood of Alexandria, Virginia. There have been many cask ales served since, but every Thanksgiving Eve, it's still a cask of Loose Cannon. Heavy Seas Brewery (then known as Clipper City Brewing) is located just 45 miles north, on the outskirts of Baltimore, Maryland. 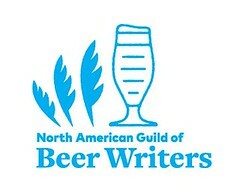 This is one of those beer events, not big and splashy, that I look forward to every year. 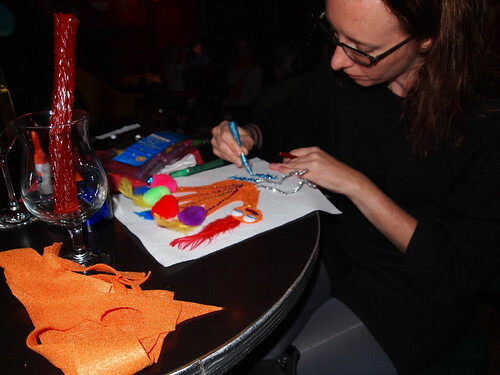 Close to home, it has fresh beer, good food, fun music, bonhomie ... and hand-turkeys! Casey Hard (r) —long-time General Manager and cellarman at Max's Taphouse— mans his 5 cask-ale 'beer engines'. The pub —located in the Fells Point neighborhood of Baltimore, Maryland, at the Inner Harbor— offers beer 140 draft beers, a "world-spanning" collection of approximately 1,200 bottled beers, and, of course, those cask-conditioned ales, pulled from a temperature-controlled room. It's a testament to the skill of Mr. Hard that he maintains his numerous draft and cask lines clean and pristine, and that the beers he pours from them taste in good condition. 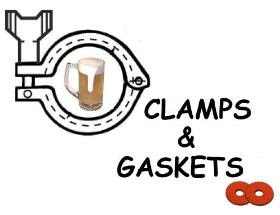 Clamps & Gaskets: News Roundup for Weeks 43/44, 2013. Feliz Día de Muertos (Day of the Dead). Via Wikipedia. National Security Agency (NSA) has been secretly tapping all Google and Yahoo data transmissions, by Americans and non-Americans alike, worldwide. Via Yahoo. A brief history of American pumpkin beer. Via Smithsonian Magazine. A fire at the Yuengling brewery in Florida causes $1M in damage. Story via Christian Science Monitor. The damage was less than it could have been, says brewery manager. Story via UPI. Lou Reed, a seminal figure in, and pioneer of, American rock music, has died at age 71. Via Rolling Stone. Touring the renovated American Brewery, in Baltimore, Maryland. Via YFGF. Beer writer Stephen Beaumont doesn't care much for the world's newest strongest beer: Snake Venom, at 67.5% alcohol-by-volume. The (only?) 3 watershed discoveries of brewers, anywhere, ever. Via Beervana. Conan O'Brien's Triumph the Insult Dog visits the Great American Beer Festival. Jazz singer, Gloria Lynne, dies at age 83. Via Wikipedia. Most successful recording: I Wish You Love. Gallup poll finds 58% of Americans favor legalizing marijuana. Via Forbes. Scaffolding to cover U.S. Capitol dome for 2 years during repairs. (Congress hiding from view?) Via WJLA-TV. The Virginia Wine Wholesalers Association and others work to overturn the Virginia Department of Alcoholic Beverage Control's ban on wholesaler participation at alcohol-related events at restaurants. Via Washington Business Journal. Pic(k) of the Week: Hiding Out? During a busy Novemberfest beer festival, Neighborhood Restaurant Group's Beer Director, Greg Engert (r), and YFGF's Thomas Cizauskas (l) find a quiet spot to talk beer business. Construction cranes appear to loom in front of a cloud front. Looking south on Warner Street. The cranes are part of a construction project: Horseshoe Casino is slated to open in 2014. Pic(k) of the Week: The American Brewery, in Baltimore, Maryland. The American Brewery building was once a symbol of a thriving East Baltimore neighborhood. Victorian Gothic in architectural style, it looked as if a red monument on a hill. The brewery would close in 1973, a victim of industry consolidation. And, for forty years thereafter, this magnificent 30,000 square-foot brewery building, listed in the National Registry of Historic Sites, would stand abandoned (but, fortunately, intact). In 2009, it would be renovated to serve as headquarters for Humanim —a not-for-profit organization serving individuals with disabilities. Funds were provided in part by the State of Maryland’s Heritage Structure Rehabilitation Tax Credit and the federal Historic/New Market Tax Credits. Most of the equipment and tanks are long gone, but the restoration, especially to the exterior, was done accurately. Humanim offered guided tours of the building as part of Baltimore Beer Week: 26 October 2013.